Plantar fasciitis (PF) is a commonly treated foot problem and affects a variety of people, with up to 10% of runners suffering from it at some point (1). Although plantar fasciitis is a common problem, little scientific evidence exists concerning the most appropriate intervention (2). So what it is exactly? Well, anything with ‘itis’ on the end means ‘inflammation’, and the plantar fascia is a thick band of connective tissue that runs the length of our feet, from your heel to your toes. So inflammation of the sole of the foot! However – as is the inconsistent nature of PF – this isnt always the case with the condition, and certainly don’t expect to see any swelling! Symptoms to be aware of include pain in the sole of the foot (with tenderness if prodded); pain at the inside edge of the heel bone; pain from the first few steps in the mornings, gradually settling as you continue walking; and of course, running, walking barefoot or on your toes and going up stairs all tend to be antagonistic and painful. Biomechanics – A review of literature suggests that a person displaying either a lower- or higher-arched foot can experience plantar fasciitis. It is thought that patients with lower arches have conditions resulting from too much motion, whereas patients with higher arches have conditions resulting from too little motion (3). Apparently with foot arches its all a little bit ‘Goldilocks’! Therefore, people with different foot types experience plantar fascia pain for very different reasons. The “windlass mechanism” is a mechanical model that provides an explanation for the varying stresses. A “windlass” is the tightening of a rope or cable. The plantar fascia replicates a cable attached to the heel bone (calcaneus) and the toes (metatarsophalangeal joints). Bringing your foot up (dorsiflexion) during the propulsive phase of gait shortens the distance between the calcaneus and metatarsals to elevate the foots arch. Without correct windlass function, the foot will not act as an efficient lever and effective push-off power cannot be achieved, which can lead to dysfunction, overload, pain. Biomechanics doesn’t stop with the foot however. We would look to assess the ankle joint, and even as far away as the hip to see if there are any areas in which the body can work more efficiently, with the aim of potentially offloading the painful foot. Issues in the tissues – the most common cause is often considered to be tight lower leg muscles. If we were to peel away your lower leg muscles layer by layer, the Achilles tendon would blend into the plantar fascia, so if the Achilles is tight – or anywhere in the posterior chain, for that matter – it can place great stress on the fascia. 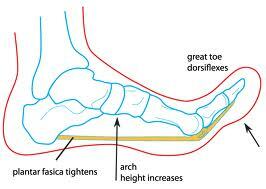 Muscle weaknesses/Imbalances – weak calf and foot muscles could both place great stress on the plantar fascia. The calf muscles are involved in controlling impact and supporting the arch. Its not just the superficial muscles either. Footwear – this is contentious and in real terms, is as much to do with running form as running footwear, however a low heel-to-toe drop may increase force on the achilles and may lead to PF. What can we do? The first step is pain management. Your R.I.C.E. (R) protocol will come in handy here. There are a few techniques available to try to offload the painful area, namely supportive taping and /or gel pads. NSAIDS can help when used appropriately. Once pain is under control – and that is a very relative term – we would look to introduce a progressive stretching and strengthening routine which would be specific to your individual needs, reflecting your individual condition, with the aim of a full return to sport or activity. (1) Chandler TJ, Kibler WB. A biomechanical approach to the prevention, treatment and rehabilitation of plantar fasciitis. Sports Med. 1993;15:344–352. (2) Crawford F, Atkins D, Edwards J. Interventions for treating plantar heel pain. Foot. 2002;11:228–250. (3) Kwong PK, Kay D, Voner PT, White MW. Plantar fasciitis: mechanics and pathomechanics of treatment. Clin Sports Med.1988;7:119–126. This entry was posted in Uncategorized on 3rd March 2015 by DCInjuryClinic.